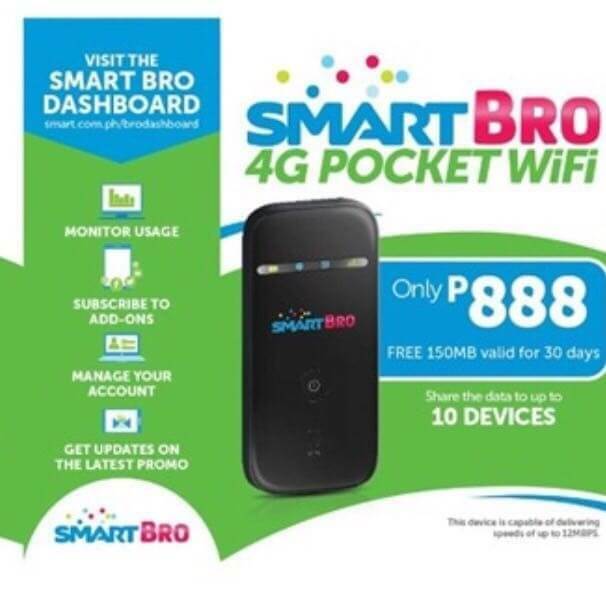 If you want internet on the go here a news to all Smart prepaid subscribers, you can now get your own 4GPocket WiFi at very affordable price. You can now share your internet connection up to 10 devices as its capable of delivering up to 12Mbps wireless cellular data. When you buy this Smart Bro device you will get free 150MB data for 30 days. Since it’s 4G you’ll get a better speed as long as your location or area is covered with Smart’s nationwide 4G network. Since this is a prepaid device once you have it you need to register with Smart LTE Surfmax promo or visit your nearest load station then subscribe to Unlisurf using the retailer menu. You can load even your SIM card is inserted on the Pocket WiFi, just familiarize your mobile number and provide it when reloading your account. There’s also a dashboard where you can manage you data usage or use Smart dashboard to monitor your daily browsing usage, subscribe to add-ons and even get the latest updates from Smart.